Ever wonder what a hot journalistic exclusive looked like in 1919? Well, you’re looking at it. Not just a pair of hands—it’s the only authentic photograph of Mr. [Thomas] Edison’s hands ever taken publisht here for the first time. At least that’s what the December 1919 issue of Electrical Experimenter magazine said. Why was a tech magazine so excited about a pair of hands? It can probably be attributed to the hero-worship surrounding inventors of the early 20th century. Men like Edison had become rock stars in a way that people who dabbled in tech never had before. Here was a man who helped build things that put the United States on the world stage, and so an entire journalistic industry sprung up to document him and his ilk. Magazines like Electrical Experimenter, Practical Electrics, and Science and Invention, all heralded the new age of technology that was emerging in the 1910s, 20s and 30s. And in pulpy rags like these a photograph of Edison’s hands was a treasured exclusive, just like an early leaked photo of an iPhone might be on a website like Gizmodo today. 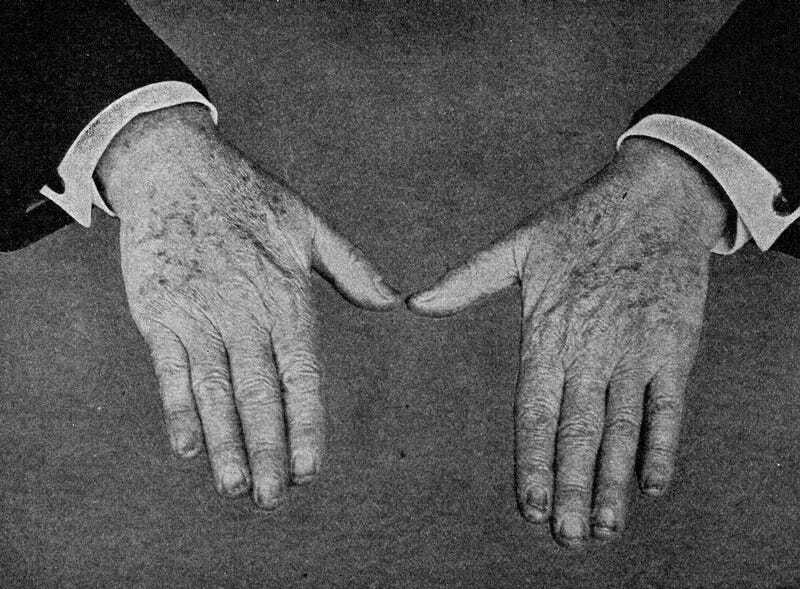 The caption to this photo even noted the chemical stains, “which could not be washt off at the time the picture was taken.” The text continued in all-caps: IF THE WORLD WERE CALLED UPON TO MAKE AN INVENTORY OF WHAT MR. EDISON’S HANDS ACTUALLY WROGHT IN ENRICHING THIS PLANET, THERE WOULD NOT BE GOLD ENOUGH TO PAY HIM. Oh. Well, I guess that’s one way to put it. We might find the hero worship of Edison (or any tech figure of the time) a bit nauseating, of course. But there is something almost naively beautiful about this photo and its presentation. To strip away a person’s mind; a person’s body; a person’s wealth; and reduce them to a pair of hands—this really does seem to be an almost charming artifact of interwar America. Might I humbly suggest that the next time photos of a new iPhone leak, someone try to track down a picture of Jony Ive’s hands?